But the high cost of college forces many students to give up on their dreams. That’s why we’re partnering with donors to create the OC Promise, a scholarship program that covers the gap between financial aid and the first year of tuition and fees at Olympic College. The program also provides support services to help Promise scholars succeed. We’re seeking 30 Bremerton High School graduates to pilot the OC Promise in Fall 2019. Know someone who should be part of that group? Does the OC Promise cover all first-year costs? No. The OC Promise covers the first year (three consecutive quarters, starting Fall 2019) of tuition and fees. Students are responsible for paying for textbooks and transportation. When I submit the FAFSA or WASFA, am I automatically qualified for the OC Promise? No. You must also complete the applications for admission to OC and for the OC Promise. The FAFSA and/or WASFA determine your eligibility for federal and state aid. The OC Promise application determines your eligibility for the Promise. 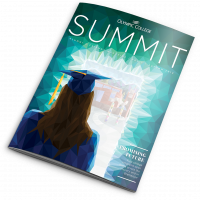 Do OC Promise students have to start in the fall immediately following high school graduation? Yes. Studies show that high school graduates who enter college immediately are more likely to complete their education. Are Promise students required to attend full-time? Yes. Studies show that students who attend school full-time are more likely to be successful and to complete their degree or certificate. Promise students are expected to enroll in a minimum of 12 credits per quarter. What if my family doesn’t qualify for financial aid? Am I still eligible for the OC Promise? Yes. There are no income requirements for participating in the Promise. However, all applicants are required to submit the FAFSA or WASFA and complete a financial aid application. Can Running Start students participate in the OC Promise? No. The Promise pilot program is for first-time college students. However, Running Start students and others who don’t qualify for the Promise pilot might still be eligible for OC Foundation scholarships. To apply, go to olympic.awardspring.com. When will I know if I’m accepted to the OC Promise pilot program? You’ll be notified by May 29. The OC Promise is a bold plan to provide one free year at OC to Kitsap and Mason county high school graduates, beginning with a pilot group of 30 students from Bremerton High School in Fall 2019. Expanding the program schoolwide – and eventually to all high schools in Kitsap and Mason counties – is dependent upon fundraising. What would the OC Promise mean to Bremerton students? One of the big factors is finances, and I think we will have kids who maybe are just missing the College Bound Scholarship (a state program for low-income students) who will say, ‘Wow, this is totally an option for me.’ And we know that once we get kids enrolled for a year, we can help them navigate from there. How many Bremerton graduates go on to college or post-secondary training programs? Over the last five years (as of the class of 2016), the average is 52 percent of our students are enrolling in college versus 60 percent for the state. But 70 percent indicate in the spring of their senior year that their plan is to go to some type of college, so there’s an 18 percent discrepancy. And my experience, over the years, is that the majority of those kids are planning to go to OC, but they don’t get there. Finances would be one primary factor. To me this is a great opportunity. Probably about half of those kids would be great candidates for a program like this. What percentage of Bremerton students are eligible for Free and Reduced Lunch? It’s 58 percent for the high school. But we have plenty of kids who don’t meet that cutoff, but they’re not much above it and that’s where the Promise could really make an impact. You have to sign up for the College Bound Scholarship in seventh or eighth grade. Some families who qualified for Free and Reduced Lunch start making a little more and you find out senior year, you’re no longer eligible. You’ve just entered the lower middle class and now you’re penalized for kind of putting things together. That’s where this can give some relief for families and also some hope. The OC Promise is funded by donors to the Campaign for Olympic College.